Anti-inflammatory effect (up to 10 times stronger than aspirin). Anti-insomnia effect due to high melatonin content. Tart Cherry Extract, obtained from the fruit of Prunus cerasus (acidic Montmorency cherry, or sour cherry) and standardised to 6.5% anthocyanins, offers powerful anti-ageing properties that help maintain optimal health. Scientists have analysed the various constituents of sour cherries, particularly the specific anthocyanins responsible for the fruit’s characteristic red colour. Although some anthocyanins are found in different types of raspberry, cranberry, blueberry, apple and grape, there are others which are only found in Tart Cherry extract (cyanidin-3-glucosylrutinoside, cyanidin-3-rutinoside, peonidin) where they act synergistically with other flavonoids (quercetin, chlorogenic acid, kaempferol ...). Studies have shown this extract to have a high ORAC index, and thus significant antioxidant capacity, due to its anthocyanin content which provides powerful protection against neurodegenerative processes. Long-term oxidative stress can result in the death of nerve cells in the brain, contributing to the development of degenerative disorders such as Alzheimer’s and Parkinson’s disease, amyotrophic lateral sclerosis and cognitive decline. Some studies suggest that anthocyanins and other constituents in sour cherries may be as effective as anti-inflammatories (NSAIDs) such as Ibuprofen (Advil®) or naproxen but without these drugs’ unwelcome side-effects (gastrointestinal bleeding, renal insufficiency). They act by inhibiting cyclooxygenases (COX-1 and 2) and by normalising CRP (C-reactive protein). Taking Tart Cherry Extract thus helps reduce joint and bone pain (arthritis of the knee), as demonstrated in a double-blind clinical trial involving 58 patients over a three-week period. In addition, it normalises levels of uric acid and means significantly lower doses of drugs (allopurinol) are needed to treat attacks of gout. It combats metabolic syndrome, cardiovascular disease and type 2 diabetes. Obesity, systemic inflammation, hyperlipidaemia and hyperglycaemia are among the components of metabolic syndrome which over the long term can give rise to type 2 diabetes and cardiovascular disease. Animal research suggests that Tart Cherry extract may reduce the development of such metabolic syndrome-related diseases. Anthocyanins can alter the activity of tissue peroxisome proliferator-activated receptors (PPAR) which affect energy metabolism and inflammation. Over a period of 90 days, obese rats were fed a high fat diet and were also given Tart Cherry extract. At the end of the study, researchers noted reductions in lipidaemia and in the percentage of fat mass and abdominal fat. They also observed decreases in IL-6 (an inflammatory cytokine) and TNF-alpha in plasma. Furthermore, sour cherry anthocyanins are now widely acknowledged to combat lipid peroxidation and atherosclerotic processes. This extract thus reduces inflammatory factors in the same way as statins but without producing the latter’s sometimes irreversible negative side-effects, particularly on the muscles and kidneys. The specific anthocyanins in sour cherry prevent the development of cancer, particularly of the colon and caecum, by inhibiting the activity of the genes responsible, and at the same time blocking the angiogenesis mechanism and maintaining the apoptosis mechanism. These valuable substances can also alter the messages delivered by cell signallers such as tumour necrosis factor (TNF). Human studies have demonstrated the efficacy of sour cherry extract in preventing muscle damage and loss of muscle strength associated with intensive physical exercise, with researchers observing improved muscle recovery, less inflammation and oxidation, and fewer aches and pains. This property is particularly important in cases of sarcopenia, which is characterised by loss of bone and muscle mass and reduced muscle strength. The recommended dose for all-round optimal protection is 1 capsule of Tart Cherry Extract a day, which provides a standardised 40 mg dose of anthocyanins. 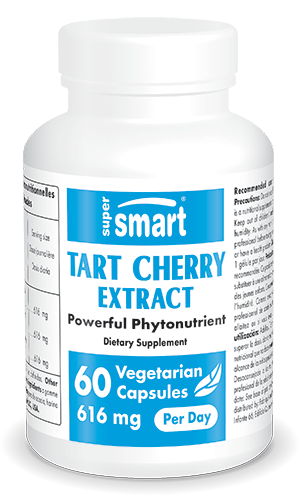 Tart Cherry Extract is guaranteed GM-, additive- and allergen-free.